3BR, 2.5BA, Village of Nags Head, Access to the Village of Nags Head Beach Club with oceanfront swimming pool and tennis courts. NON-SMOKING. PETS ALLOWED WITH PET FEE. BEDS: 1 King, 1 Queen, 2 Twins, Full-Size Futon. Perfect vacation cottage located on the west side of Highway 158. It is right off the main road and has nice views of the Nags Head Golf Links golf course and clubhouse. It is a short drive over to the public beach access or the Village Beach Club or an enjoyable walk. Shuttle service also provided that runs during the peak season to take you and all your gear over to the beach. Flat-Screen TVs, WiFi, DVD player. 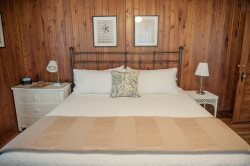 The Beach House rental rate includes linens and towels for each room, beds made upon arrival, starter soap and toilet tissue each bath and starter soap, paper towels and trash bag for the kitchen.